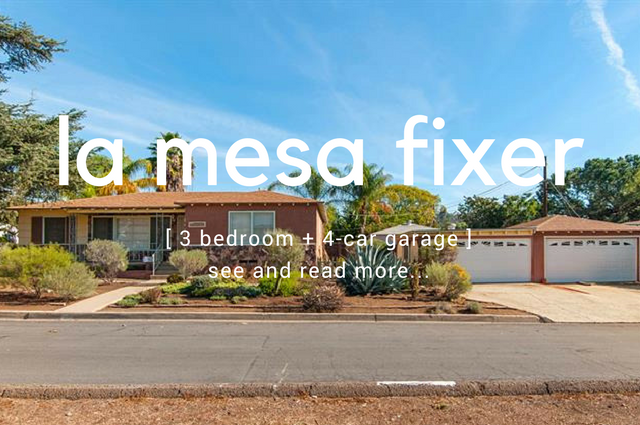 This 1208-sqft, 3-bedroom, 1.5-bath, 50’s charmer in La Mesa provides a decent-sized (for La Mesa) corner lot, but also a great 4-car garage! It’s not too often you find a typical entry-level suburban 50’s home in San Diego with a 4-car garage. Perfect for those with their toys, hobbies, or simply need the extra space, this garage will certainly handle it all…and more! The Linden home is priced at $515,000. The home has an original floor plan, which does not bode well for today’s buyer appeal, but definitely has upside to it, and the ability to make those changes. I’ll also add that the home needs…work…like pretty much everything needs to be updated throughout. What you get here, however, is a great property setup, in a good neighborhood, and the opportunity to make it YOUR OWN! With interest rates remaining relatively low and the market conditions continuing to improve (values, that is), this home is surely to go quickly due to the current market demand for homes such as this. Take a look through these photos, and if you’d like more info on the property, or would like to come take a peak with me, well – just get in touch, but quickly! 1208sqft, 3-bedrooms, 1.5-baths, 1950 built, 4-car garage, 6,844sqft lot.